Operation Just Cause was not authorized by the Democratic Party-controlled Congress. But there was a lot of progressive legislation that came to Bush’s Oval Office desk for his signature during his term, and he had little choice but to sign most of it. (See a partial list of the legislation here). 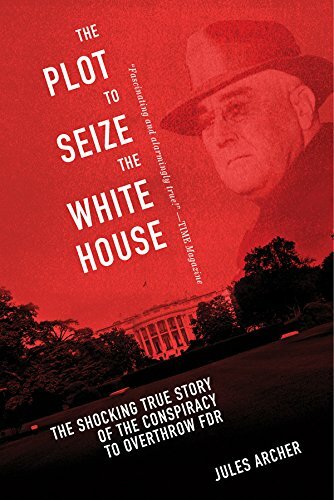 President Franklin Roosevelt made an enemy of the richest Americans with remarkable haste. By his first term, his heavily progressive New Deal taxes and the suspension of the gold standard inspired vocal opponents within the highest echelons of industry. Among them was an irate William Randolph Hearst,who filmed a message decrying the “impudent” and “despotic” new tax code. Yet of all of Roosevelt’s powerful enemies, perhaps none were more formidable, or incensed, than those who considered throwing him out of office by way of a fascist military coup. At the time, Butler was enjoying the boost of a positive public profile, as a result of his enthusiastic advocacy for veterans. 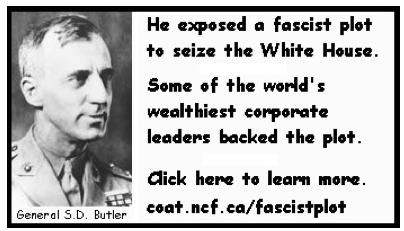 American Legionmembers Bill Doyle and Gerald MacGuire wanted to harness this when they asked Butler to appear at the Legion convention in Chicago, as part of a campaign to undermine the body’s leadership. Butler was sympathetic: He had long known of the Legion’s capacity for ignoring its members. Atthis point, Butler knew MacGuire was taking orders from someone, and requested to speak up the chain of command. It was then he met with Robert Sterling Clark, whose net worth of $30 million owed much to a recent inheritance from the Singer sewing machine fortune. Butler remembered Clark as a “millionaire lieutenant,” from when they served together during the Boxer Rebellion. Clark was blunt about his concerns. He and his associates hoped Butler would encourage support within the Legion and perhaps the country for the reinstatement of the gold standard. “I am willing to spend half of the 30 million to save the other half,” Clark confessed. As Butler suspected, this appeared less and less to be about veterans’ interests. Shortly before the committee hearings, in September of 1934, the newly formed American Liberty League—made up of leaders and captains of industry opposed to the president “fomenting class hatred” and his handling of the Depression—released a statement. Among its members were the DuPonts, S.B. Colgate,Sewell Avery, John Raskob, Alfred P. Sloan, and former secretary of State Elihu Root. Butler noticed Robert Sterling Clark’s name on the list, as well as Grayson M. P. Murphy, Gerald MacGuire’s boss. 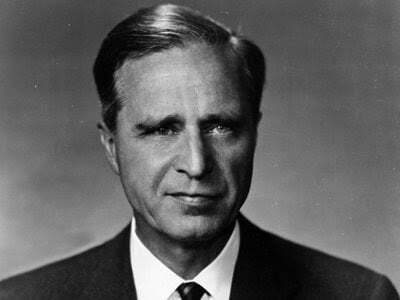 Also implicated in the plot was Al Smith,former New York governor and 1928 Democratic presidential nominee, as well as Prescott Bush, a banker, future Connecticut senator, and father to George H. W. Bush and grandfather to George W. Bush.